EURO-II or Simpson's S-4 water-cooled diesel Engine having 54 H.P & 2300 R.P.M. Having minimum working width 2.5 mtr & maximum 4.5 meters. With capacity to lay material up to 200 mm with hopper capacity 4.0 cu. mtr. we are leading manufacturer, supplier and exporters of mechanical paver. With an aim to fulfill the ever-changing demands of our esteemed customers, we are engrossed in providing a supreme quality gamut of Paver Finisher. The most preferred paver finisher by the Indian road construction companies for the robust construction, ease of operation, high uptime and resale value. 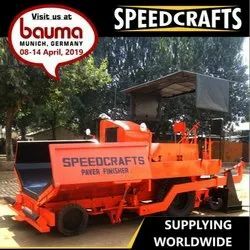 We manufacture a Wide range of Mechanical Paver Finisher that are suitable to finish the asphalt road, used for rapid finishing to avoid traffic problems as pre morth specification, these machine are most economical and efficient solution for laying wet mix macadam & dry lean concrete in line. We offer a range of Mechanical Paver Finisher which is designed and manufactured to offer maximum benefit to our clients. 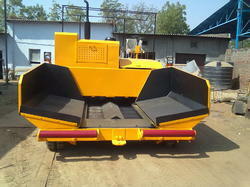 These Mechanical Paver Finisher is a value for money product. Our Paver finishers are the most economical & efficient solution for laying Asphalt and Wet mix macadam. Our products are having a features like, User Friendly and Easy Operation.